Race #3: Hoškovice, Czech Rep: 23-24 june. Eight teams were present for the third race in the Euroserie. Conditions were colder then usual, a strong side wind and some rain on saturday, but a little better on sunday. For safety reasons, the decision was made on sunday to do the eliminations on the 1/8 mile instead of the usual distance. And all qualifications were solo runs. Jan Malmberg was first in line in round one. A good beginning of the weekend for Janne, as he produced a "seven seconds pass" with his superchargered V-twin. The "test & tune" on friday late afternoon was, as usual, used by Herman Jolink who had fitted new pistons that gave the Ducati motor a bit more compression. But it did not help him much during his first qualification attempt. 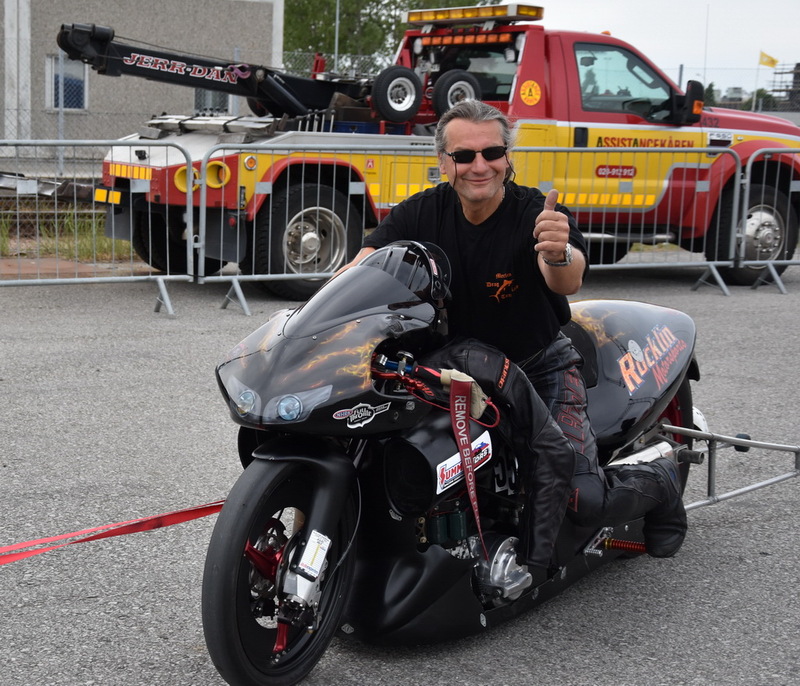 The team of Anders Jensen from Denmark also tried to make a rest run on the quarter mile strip on friday, as Anders had only raced his supercharged Harley on the 1/8 mile tracks of Malmö and Mosten. But the gearbox refused to cooperate, and the team started wrenching. During the first qualification, Anders did the quickest 60-foot of all, but the valve train components could not handle the horsepower that the bike produces since early this season. The team tried to repair, but had to throw the towel, later that day. Sven Ole Schleichert qualified # 6 in round one on his Destroyer. There were no other V-rod to play with, as Sasha Brodbeck broke his gearbox at the last race, at Alkersleben. Joerg Lymant had already won the first two races of the Euroserie, and was the top qualifier after round one with 7.77 seconds. Martin Buehler from Switserland is trying hard to go quicker the the previous owner of the bike. Martin hit the rev-limiter several times during his attemps. 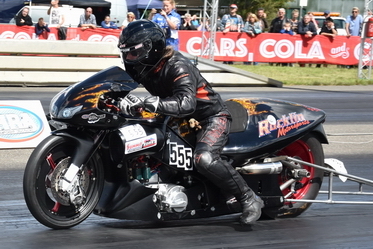 Janek Severa was very busy, he had entered two classes with his Suzuki TL1000, STTG and the Competition Dragster class. Janek suffered gearbox problems, as it often refused to shift. Martin Buehler's bike stopped half way down the track in round two. Then Sven-Ole Schleichert did a new personal best. Well done! Peter Niklas entered the race on the old turbocharged Honda with Christian Bruhn as his assistent. Both men have American V-twins that still need some work to become race ready. They arrived late and skipped the first round. Peter qualified at place #8 after round two. Then a great run by Jan Malmberg! 7.79 seconds, A new personal best! Rain spoiled the fun for the rest of the day, but two more rounds of qualifications were held on sunday around noon. Herman Jolink's bike blew a head gasket at the end of the track in round three. He went to swap the engine for his spare, but ran out of time. Peter Niklas was the only one who improved in sunday's qualifications and he moved up to place #6 in round three, while the #3 in the list was about to leave the track and go home. Jan Malmberg produced his third "seven" of the weekend in round four, 7.82, and grabbed the bonus points for speed doing 279 KMH. Joerg Braune is still working hard to turbocharge his Topgas bike, and joined the Modified Streettwin class with his Sportster (that is for sale) for the occasion. Joerg was beaten in the finals by Kostelka.He hopes to have his topgas bike ready for the Mosten Raceday at the end of august. Janek Severa (picture above) reacted better against Lymant in the quarterfinals, but that did not prevent Lymant from beating him. Martin Buehler advanced easily while his opponent Jolink was still wrenching in his tent. It took Malmberg only five seconds to send Schleichert home, and the opponent of Niklas was already out. Black smoke from Malmberg's bike in the finals, while Lymant had lane choise, the better reaction and his bike ran flawless. Joerg Lymant won the third race in a row. Next race is at Drachten in the Netherlands. Probably enough entries to do a 16-field dragrace! Mats Larsson tested his bike at the quarter mile of Sunsvalle, and will join Jan Malmberg at his trip to Drachten. Jan solved the injector problems he suffered from at Hoskovice. Team Sweden will be at Full Force at the next race.